Every time I find myself driving down to Boston or Rhode Island, I’m usually finding myself looking for a new place to try for breakfast along the way. This time, we decided to take the Everett Turnpike (Rt 3), which takes you through the Nashua and Tyngsborough area. And, in this case, right by Tyngsborough’s Dream Diner. While not being the most attractive of diners, it did have one feature that is always the sign of a good breakfast: a long line out the door. Indeed, we spent our first 10 minutes at the dream diner standing outside, but the waitstaff is friendly and brings you a cup of coffee to drink while you wait. Inside, it’s a colorful diner. Sometimes oddly so, with the bizarre brightly-colored ceiling fans. But the seating is plentiful, and almost entirely booths. The food here is your basic diner fare, good, but greasy. The one thing that did stand out, however, is that they had a whole menu of Eggs Benedict varieties. Being that it’s my current go-to dish for breakfast (having displaced biscuits and gravy, mostly since New England places generally need to get shipped off to remedial biscuit school), I ordered their standard Benedict. I’m glad I did, since it was was quite a good Benedict. Unlike your typical benny with a thin slice of Canadian bacon, Dream Diner uses a solid 1/2″ thick slab of ham. And it’s good ham at that, nicely roasted, flavorful, and not too salty. The eggs were nicely poached, and the hollandaise sauce was quite flavorful (although I like just a slight bit more tanginess). 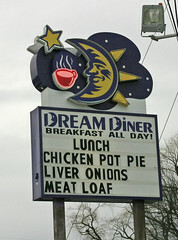 Dream Diner is definitely on my “repeat visit” list. Our last full day in Brussels was one of wandering and exploring. Sophie went off to see some old sites from when she lived there. Dan went to check out The Royal Museum for Central Africa, mostly a museum about Belgium’s sordid colonial past. And Carol and I decided to do a bit of a walking tour, checking out the botanical garden, the old 19th century homes around Square Ambiorix, and then checking out the Parc du Cinquantenaire and L’arc de Triomphe, the last of these being a rather large and impressive park originally built in 1880 to commemorate the 50th anniversary of Belgium. At the Arch, we rendezvoused with Dan and Sophie, and decided to find a pleasant place to eat, eventually settling on Carpe Diem, a brasserie just east of the Arch on Avenue de Tervueren. It’s getting almost to be a running joke at this point, but like a lot of the previous reviews, Carpe Diem is your basic Belgian brasserie, with a menu focusing primarily on traditional Belgian dishes (I must make a note to myself here to try some more ethnic food the next time I’m in Brussels…). But they really do have a good selection of traditional Belgian dishes, including Lapin à la Gueuze (Rabbit in a Gueuze beer sauce), Carbonades Flamandes (Flemish stew), Chicons au Gratin (basically potatoes au gratin), Vol-au-vent, and Stoemp de Saison (basically an elaborate mashed potatoes), as well as a good selection of Belgian beers and side dishes.